In honor of sister’s birthday, Nicole Ackerman, our Family Coordinator, shares her family’s story and how they became a part of the Family Reach community. My sister Maribeth was the middle of five children. A beautiful, healthy, vibrant and deeply intelligent young woman, she followed her dream and set out to San Francisco about a year after college. Just before Maribeth was to start her new job in this new, exciting city, she was diagnosed with a rare metastatic sarcoma. Her life changed in an instant. She went from being invincible to vulnerable and isolated. Our family buckled down for what would turn out to be a valiant year-long battle with intense chemo, radiation and multiple surgeries. Maribeth was never able to start that job or return to her life in San Francisco. We were all in college or in graduate school when Maribeth was diagnosed. I was about to enter my sophomore year. 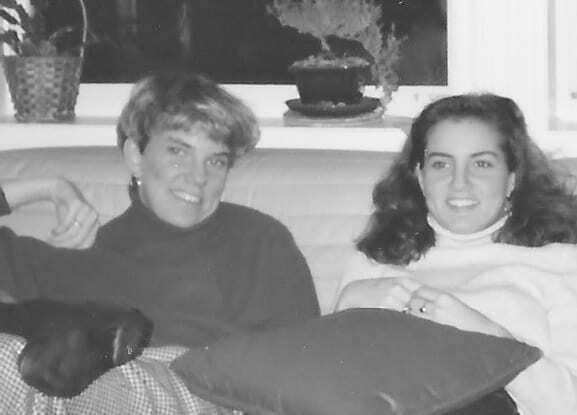 Nicole (right) with her sister Maribeth while she was in treatment. Before her diagnosis, we were already acutely aware of the financial strain of college tuition. My father ran his own real estate firm and my mom was a nurse program director in Milton. Five college tuitions within five years are difficult for any family to face, but add in a cancer diagnosis and it became impossible. I immediately decided to stay home from college to alleviate the expense and assist in the care and companionship Maribeth needed while my parents balanced work to keep the family afloat. Because Maribeth was a young adult with no employee benefits yet, our family faced the expense of cancer treatments, and all that came with it. This new world brought financial challenges we never could have imagined. Living the daily life as a cancer patient, or caregiver, is a life-altering experience that no one can truly understand unless they are in it. Throughout many of the challenges we faced, our extended family, friends and large, loving community rallied around with support. But each day at the hospital Maribeth and I met young adults who faced the cancer battle alone. We met families who literally didn’t know where they might sleep that night, after a three-hour drive to get care at a Boston hospital. We met parents with children who had been in years of treatment, leaving them unable to work. Upon Maribeth’s death in 1993 at the age of 24, our family vowed to honor her memory and honor those who faced the financial struggle of cancer. We created the Maribeth Merrigan Foundation in 1997 with a three-tiered mission: education, cancer research and cancer patient support. Our first financial commitment was to honor her love of education and adventure by funding a foreign language lab at Notre Dame Academy, her alma mater. Raising the required funds was daunting to say the least. But we were all determined and energetic and each family member had a unique professional skillset to bring to the table. Over the next 10 years we created an endowed scholarship at Notre Dame Academy, funded a research fellowship at Mass General and created a Patient Assistance Fund at Dana Farber in Maribeth’s name. This fund was established to specifically assist young adults struggling with the financial burden of cancer. We are proud to say the Maribeth Merrigan fund is permanently endowed at Dana Farber and continues to provide emergency funds to young adults facing cancer treatment. By 2013, we felt our efforts had made a great impact, but we knew families still needed significant assistance with the financial burden of cancer. I read a news article about Family Reach and immediately knew I had to meet the organization’s leader, Carla Tardif. Family Reach was doing exactly what we wanted to do – working directly with social workers at hospitals across the country to identify families who need help and directly paying their mortgage, rent, utility bill or car payment within days, allowing them to focus on treatment. We were all captured by Carla’s passion, her magnetic personality and her commitment to go big with the Family Reach mission. She had a vision and determination; we knew the Maribeth Merrigan Foundation had to jump on board her train to have a bigger impact on families! Together with Family Reach, we hosted a 20th anniversary celebration of Maribeth’s life and announced our foundation’s full support of Family Reach. I joined the Family Reach team full time and began working directly with our family grant recipients to help tell the important story of the financial reality of cancer. The best way for our supporters to truly understand the importance of our mission is to hear from the families we help. It is an honor to witness the connection of people who need help with people who want to help. My entire family continues to avidly support the Family Reach mission and lend their professional skillsets whenever they can. We are completely confident that Family Reach carries on the mission of the Maribeth Merrigan Foundation in the most efficient and effective way possible. With Family Reach, we know that not only do families receive financial assistance, they receive the financial education and support they need to say on track. We know in our hearts Maribeth would be tremendously proud of the work we do each day to keep families afloat as they navigate cancer. How can you get involved? Join our Key Holder community.